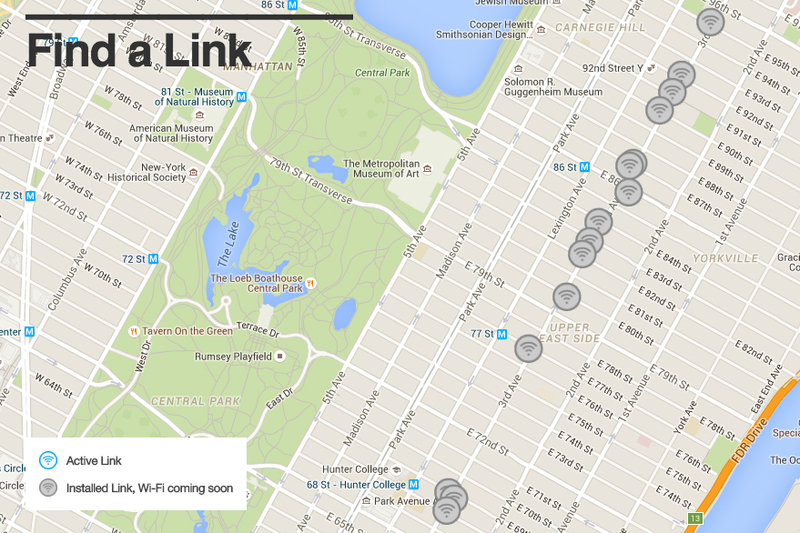 LinkNYC Has Installed 16 kiosks on the Upper East Side. UPPER EAST SIDE — More than a dozen kiosks with free WiFi hotspots, phone service and cellphone charging have been installed in the neighborhood along Third Avenue. 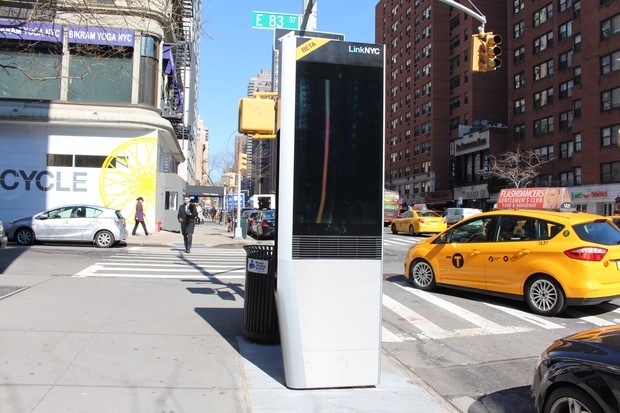 In the last few weeks, 16 of the tall, sleek machines with a 911 button, a key pad and USB ports, have been planted on the Upper East Side, replacing telephone booths as part of the city's new LinkNYC project. Multiple kiosks have been placed on Third Avenue at East 60th, 68th, 69th, 77th, 80th, 82nd, 83rd, 86th, 87th, 90th, 91st, 92nd, and 95th streets. The first kiosks were installed at 15th Street in the East Village in December. Once activated, users will be able to surf the web, make phone calls and use the kiosk's public WiFi, within a 150 feet radius from the machines. They have the ability to serve hundreds of users at any one time, all for free. Screens on either side of the kiosks will be lit up to sell advertising, which will financially sustain the system and is expected to rake in roughly $500 million in a 12-year period, according to officials. CityBridge, the service provider that has a 12-year contract with the city to invest at least $200 million in the system, will activate the kiosks once a water main project is completed at 57th and Third Avenue, according to a spokeswoman for the company. Upper East Side residents passing by the East 83rd Street kiosk were excited for the machines to boot up. "I like the look of them — they're sleek and modern and have a 911 intercom and a place to charge," said resident Rochelle Pillar. "As long as they show fun, nice ads that are relevant, otherwise it would cheapen the look." Pillar said she might use the kiosks but she knew her son would. Retired resident Stan Ryan said he doesn't have a problem accessing the internet on his phone, but that LinkNYC is a good idea. Others were confused and a bit skeptical, including resident and entertainer John Blair. "I don't even know what it is. I thought it was for parking," he confessed. "We're moving into the future, but I think for one person to sit here plugged into a big machine to charge their phone ... it's a lot of unit for little payoff." By July, CityBridge plans to have 510 kiosks in locations on Third and Eighth avenues above 14th Street, northern Manhattan, the South Bronx, Jamaica, Flatbush Avenue, and St. George in Staten Island, according to a statement from CityBridge. By the fourth year of the program, CityBridge plans to roll out 4,500 kiosks across the city.